The retail prices of Intel’s upcoming Haswell Refresh processors have been revealed by Computerbase which show variants ranging from the top $303 US Core i7-4790 to the entry tier Celeron G1840T which will cost $42 US. Intel’s Haswell Refresh processors will launch on 10th of May and would be available for both Mobile and Desktop consumer platforms. Intel initially launched their fourth generation Haswell processors in June 2013 at Computex. The processors featured the latest 22nm core 3D Tri-gate transistors technology which improved the IPC and efficiency by a decent amount of Ivy Bridge. The upcoming Haswell Refresh processors are no different then these featuring bumped up clock speeds and more SKU design schemes such as low TDP and low power variants available at similar price points. A total of 26 desktop processors have started shipping to retailers across the globe and would be available for sale in the upcoming days prior to their official launch planned for next month. 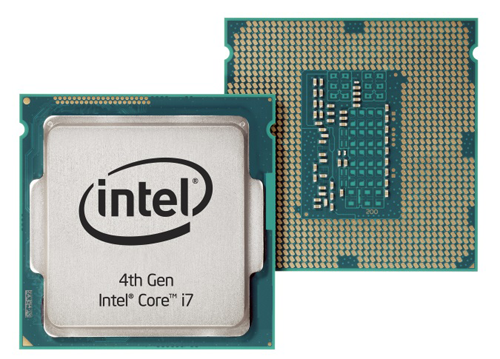 The Core i7-4790 will be the flagship processor of the Haswell Refresh lineup and the first 22nm consumer CPU to obtain clock frequency of 4 GHz. It will feature 4 cores and 8 threads. The Core i7-4790 will also be available in ‘S’ and ‘T’ variants which will retail at the same price of $303 US but will feature lower clock speeds since they are aimed towards low TDP and low power platforms. Other models include Core i7-4785T, Core i5-4690, Core i5-4590, Core i5-4460, Core i3-4360, Core i3-4350, Core i3-4150 and several Pentium and Celeron variants all of which would be available in “T” and “S” variants. Supported by the latest 9-Series chipset (Z97/H97/B95) motherboards which have started to leak just a few days ago, the new Haswell Refresh processors would be available on 11th May 2014. The K-Series Haswell Refresh series would arrive a bit later in Mid 2014 so we can expect launch in June or July 2014 timeframe.The 9-Series motherboards would feature superficial changes since they come with almost the same feature set as 8-Series except they add support for M.2 interface and a few other vendor exclusive tech. Computerbase has also find out the prices of Intel’s Haswell Refresh mobile processors which is getting updated with 17 new processors. Six processors fall in the M-Series, three in the H-Series, six in U-Series and two in Y-series the details of which are given below.